Add this vanity to your bathroom for more modern style in your home. Its drawers and roomy double-door cabinet are great to keep bathroom items in. Add a classic feel to your bathroom with this simple vanity set from Wyndham Collection. Enjoy the popular modern look in your bathroom with this beautiful vanity. Made with a roomy double-door cabinet and drawers, this vanity has lots of room to keep items like toothpaste, towels, and hair brushes. Bring a classic look and feel to your bathroom with this beautiful set from Wyndham Collection. If you want a vanity that is both stylish and useful, this modern vanity is perfect. With a double-door cabinet and drawers, this vanity can hold all kinds of bathroom items. Bring a classic look and feel to your bathroom with this beautiful set from Wyndham Collection. This vanity is a great way to add modern style to your bathroom. Made with a roomy double-door cabinet and drawers, this vanity has lots of room to keep items like toothpaste, towels, and hair brushes. This simple vanity set from Wyndham Collection will fit right into any bathroom decor. Amare 36-inch W 2-Drawer 2-Door Wall Mounted Vanity in Grey With Top in Green With Mirror Add this vanity to your bathroom for more modern style in your home. Its drawers and roomy double-door cabinet are great to keep bathroom items in. Add a classic feel to your bathroom with this simple vanity set from Wyndham Collection. 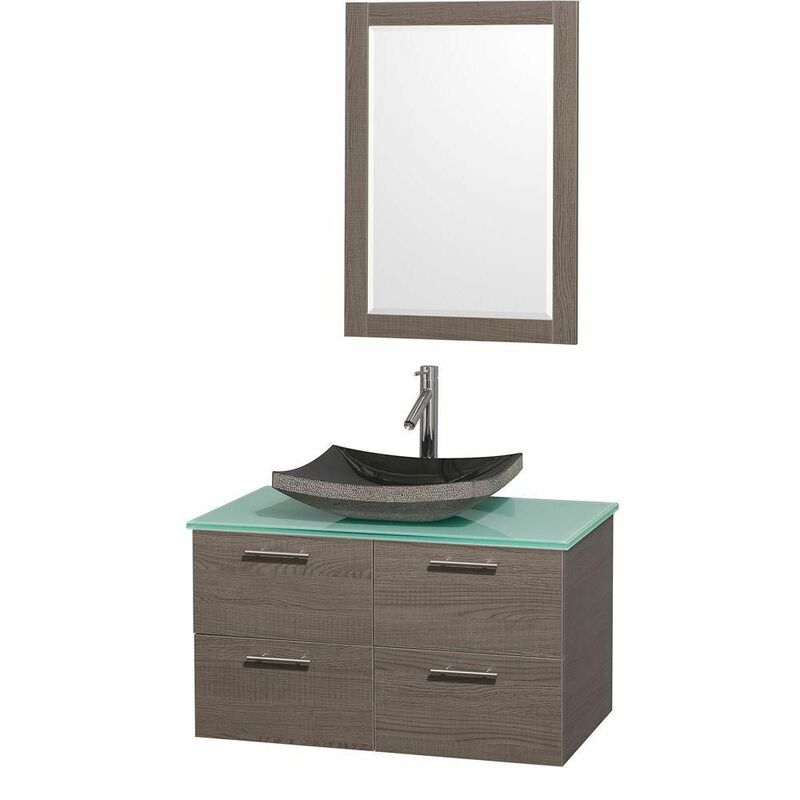 Amare 36-inch W 2-Drawer 2-Door Wall Mounted Vanity in Grey With Top in Green With Mirror is rated 5.0 out of 5 by 1. Rated 5 out of 5 by pstack from Excellent product, exceptional look This is an excellent product with an amazing look and easy installation! Installed this in our basement bathroom and now it looks better than our regular baths! I guess I need to get 2 more. Price was a bit steep though, wish it was less.